The key economic objective of most beef enterprises is to improve the profitability of the business (ie maximise returns over costs) through the use of superior genetics and efficient management. Studies show that a major way to increase profits is to improve the genetic merit of the herd through the selection and introduction of economically relevant traits (ERT’s). Careful selection contributes more improvement in a beef herd than any other single practise. Alternatively continued use of seedstock that lack good beef characteristics results in a decline in genetic merit and ultimately reduced productivity, profitability and market acceptance. Producing the most suitable replacements (bulls/females) requires that seedstock providers accurately assess the current genetic merit of the herd and select traits that meet the expectations of their breeding goals and the requirements of the market. Bull selection in conjunction with progeny selection and culling represents the quickest opportunity to increase profitability through positive changes in the genetic merit of the herd. Most producers however, raise their own replacement heifers which can limit the opportunity for rapid genetic change for several reasons. Firstly, in most herds, the amount of genetic variation amongst potential replacements is relatively small. Additionally, the availability of the very best heifers is restricted resulting in the retention of heifers that are representative of the herd average. Finally, since a large proportion of potential replacements are necessary to maintain herd size and meet ‘forced culling’ requirements, a large number of heifers retained invariably are representative of the average herd genetic potential. Given these circumstances and the frequently limited availability of objective information to select heifers there is an increased importance and emphasis on bull selection. That is, since a relatively small number of bulls cover a large number of females (30-50 per bull) bull selection provides the most practical opportunity to improve the genetic merit of the herd. Genetic change through selection is long term since the change is permanent until additional new genetics are introduced to the herd. Whether selecting for growth, carcass traits or maternal performance, traits once established in the herd are automatically passed onto the next generation, ie the side effects will remain in the herd for a considerable period of time. For instance, if a sire is used for 4 years and the daughters are retained, the sire impact will extend into the next decade. Whilst each generation dilutes the sires contribution, the grand daughters and great grand daughters may remain in the herd for a considerable period. The use of sons of sires in the herd can accentuate the genetic imprint. 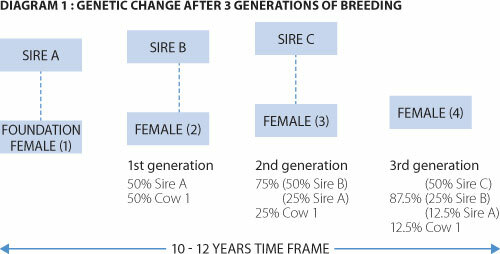 After three generations up to 87 per cent of the genetic change can be attributed to the sires used (Diagram 1). Subsequently, the selection and acquisition of bulls should not be viewed as a short term investment since the impacts on genetic merit of the herd and the profitability of the beef enterprise are far reaching (ie positive or negative). 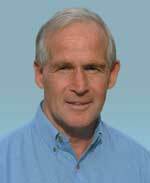 It is re-emphasised that the most powerful tool available to beef breeders to bring about change that leads to genetic improvement is careful selection. If the heritability of a trait is high, genetic change is increased and the converse also applies. If the desired genetic make up is not present in the herd no degree of selection will achieve an increase in gene merit. If the gene is recessive, breeding progress will be slow. If the desired gene has a high heritability and is present at intermediate frequency levels selection responses will increase. This depends on what percentage of a group of animals is included in the group retained. A high intensity of selection is when a small percentage of animals is selected or a high percentage is culled. With heifers, intensity of selection is dependent on the reproduction rate in the particular herd which places an upper limit to the number of replacements available for selection. It is generally accepted that where conception rates fall below 70 per cent, selection intensity in heifers can be too low. Assuming 70 per cent conception and a 50 per cent male:female ratio only 35 heifers are available for selection in a herd of 100 breeders. If the replacement rate in the herd is 20 percent and infertility in heifers, mortalities and forced culling are considered there may be 20 heifers (or less) to select replacements from. With bull selection the intensity can be much higher at similar reproductive rates because less bulls are retained. The larger the gene pool, the greater the probability of finding animals with the superior traits. Size of the gene pool is influenced by the herd size and genotype range in the herd. With closed herds (ie small or large herds practising inbreeding and linebreeding) the genetic variation can be severely restricted. Large herds that outsource numerous sires generally have relatively high levels of genetic variation. Small herds using a restricted number of bulls generally have lower genetic variation. However, small herds using a wide range of AI sires can have quite a high level of genetic variation. Additionally, small-medium sized studs can have equal if not superior genetic merit due to high levels of selection intensity. This is defined as the average age of adult. The major affect on generation interval is the replacement rate in the breeding herd. Replacing 20 per cent of the cows in a herd annually will imply that the cows remain in the herd for 5 years from the date of first calving. Replacing 25 per cent of the cows annually will mean that cows remain in the herd for 4 years from the date of first calving thus reducing the generation interval by one year. In high genetic merit herds, the replacement rate can be as low as 10 per cent. In herds with superior cows producing superior progeny the generation interval can be quite high due to the number of older cows. As outlined in an earlier ABBA Journal (2009) publication, qualitative traits are mainly related to simply inherited traits involving one or two genes (eg coat colour, horned v’s polled cattle). Most traits of economic significance (eg growth rates, muscle definition) are multigenic in character (ie quantitative) involving several genes in conjunction with environmental factors. Tandem selection - one trait of an array of traits is selected for and once a trait is established within the herd to the breeders satisfaction then a further trait receives attention. The process continues until all the selected traits are addressed. Independent selection- several traits with a certain standard are considered at one time. Any individual falling short of the target levels are culled. Alternatively, the high achievers are selected. Index selection - all the selected traits are examined concurrently and the relevant measurable data is included in the calculations (eg Breed Plan). In herds not involved in index selection programs, independent selection is the next best option. The main advantage over tandem selection is that where an individual is weak in one trait but strong in other traits, consideration can be given to its retention or otherwise. With tandem selection, the practical problem is that when there is selection for additional traits the previously selected traits may be compromised. Where there are numerous ERT’s to consider it is generally accepted that selecting for a large number of traits at one time is very ambitious and could provide negative outcomes. Not only does it impair genetic progress it makes selection and its implementation difficult. Due to the number of genes and possible environmental interactions involved in the assessment of quantitative traits, special selection processes using mathematical models were developed (eg BreedPlan). These programs, however, are dependent on suitable decision support systems and the accuracy of measured data. The Australian beef industry has a triangular structure. The point of the triangle consists of a relatively small number of stud breeders servicing the bulk of the triangle ie the commercial breeders. Subsequently, the breeding policies of stud herds needs to be aimed a the selection and production of stock that satisfy the requirements of commercial breeders. Sire selection needs to match the market requirements, productions systems and the resources available. For instance, excessive size and the need for high feed requirements may not be the most suitable cattle for a range of grazing systems using limited amounts of supplements. High milk yields can also be a problem in nutritionally constrained environments (eg an increase of 2 litres in milk production increases the energy requirement by 15 per cent, protein intake by 21 per cent and key macro minerals (calcium and phosphorus) by as much as 37 per cent. Bull purchasers are interested in acquiring stock that enhance the genetic merit of the herd through the introduction of economically relevant traits (ERT’s) that improve the profitability of their operations in specific environments (eg climate, economic and nutritional). Since beef operations exist in a wide range of environments the challenge is to select and produce bulls for various operational systems. Increasingly seedstock producers need to proactively react to the signals from the client base to provide bulls that meet both environmental and market requirements. Selection for genetic change depends on a number of factors such as market suitability, breeding goals, enterprise resources and environmental constraints. These factors introduce variation in the type of bull required for specific operations and environments. Heifer acceptable bulls – this is a speciality type of bull that is used on first calf heifers or when beef operations are conducted in poor nutritional environments. Typically these ‘easy calving’ bulls have a small-medium frame score and the calves whilst not expressing high birth weights have acceptable final weaner weights. Often the cows in these environments (eg coastal country) are small framed and calves are weaned at 6-7 months for the local weaner market. Early maturing bulls – this type of bull produces calves with exceptional weaner-yearling performance and carcass acceptability. The selection of heifers depends on a suitable frame score and breeding goals. To maintain an acceptable level of growth, selected bulls need to have a medium frame score and strong muscle definition. Upper extremes in frame score should be overlooked to avoid producing late maturing stock. Early maturing stock are suitable for a range of environments with the production of stock suitable for a range of markets. All purpose bulls – these animals show moderation in birth weights, growth and milking ability. These bulls should breed females that are acceptable for a range of environments. They should also have the ability to produce progeny with sufficient mature size and milk capacity in highly nutritional environments. Low maintenance bulls – these have the capacity to produce female replacements for environments that have lower nutritional resources. Typically, the cows have a smaller mature size and reduced maintenance requirements. In better nutritional environments production (meat/ha) can be increased with higher stocking rates and higher reproductive performance. High maintenance bulls – in good nutritional environments and high levels of feed management producers may select cattle with high frame scores. The trade off is that the replacements will be larger, slower maturing and have higher maintenance costs. If the female progeny do not receive adequate nutrition they lose condition with lower reproduction rates and longer calving intervals. Bulls may require excessive feeding to be presented for sale at 2 years of age. Note – with all of the above categories of bulls it is essential that emphasis is focussed on both functional traits (eg udders, foraging and walking ability) and economically relevant traits (eg carcass characteristics) to meet the market and environmental requirements of specific beef operations. The bull selected is generally considered to form half of the future herd, because he supplies half of the genetic make up of the calf drop. Additionally, 87.5 per cent of the genetic make up of the cows comes from the last three bulls used (Diagram 1). Subsequently, the importance of selecting genetically superior bulls for ERT’s and functional traits is fundamental to long term herd improvement. Bull performance information needs to be evaluated in conjunction with visual assessment and final selection based on traits that improve productivity and functionality. Any bull (irrespective of marketing and pedigree) that cannot positively contribute to herd improvement should be eliminated from further contention. It is also important to recognise that in herd performance figures simply indicate the ranking of that bull in that herd. It doesn’t necessarily mean that the bull is suitable for all production systems if the environments are dramatically different. Once performance information has been objectively evaluated it is important to visually assess the bull for structural soundness and other non measurable traits and beef characteristics. The bull(s) should be well muscled which is evident by the bulls overall muscle pattern and definition. Terms such as long, smooth or flat muscling are misleading. Length of muscle depends on frame score and flat muscle is unlikely since muscle fibres are round and bundles of these fibres make muscle tissue. Smooth muscle might actually mean that the animal has a good fat cover which covers a multitude of defects. Visual assessment also allows the assessment of length, depth, width, legs and feet, overall structural correctness and frame score. Certainly there is scope for growth factor but remember the catch phrase – a cm in height is worth cents but a cm in width is worth dollars. Breeding plans for genetic improvement are designed to combine genes in a population into the most advantageous combinations. Subsequently, mating systems need to be conducted in conjunction with selection and culling. A combination of these procedures can then result in genetic progress. The implementation of the efficient selection and mating systems will result in genetic change (ie the presence of the desired genes). Once the breeding goals involving trait selection are achieved the breeder may introduce a new set of goals and the whole process starts again. The challenge for all breeders is to maintain the level of desirable traits at a suitable level whilst continually trying to introduce additional economically relevant traits that enhance productivity, profitability and market acceptance of the derived seedstock. Eventually, the selection for a trait reaches a point where further improvement is slow but because genetic variation continues with new genetic material, breeders will always face new challenges. A key challenge to stud breeders will be to ensure that the introduction of new genetic material enhances genetic progress and further contributes to the requirements of the main breeding goal, ie the production of bulls with the capacity to improve ERT’s that increase the productivity and profitability of beef enterprises based on pasture systems. To achieve positive genetic change the accuracy of selection must be high and the parents must be genetically superior to the average population. More progress will be made with a restricted number of highly heritable economically relevant traits and shorter generation intervals.